I’m not sure what it is with me and tambourine dancers BUT I LOVE THEM. Sort of a mash-up of Esmeralda and Arabian-ish dancers (I WISH I’d had time to sculpt a goat and a better base, but I take six classes per term). This is the fruits of my laborious and awesome class with John Brown at Gnomon – first time doing an entire figure (and my other experience only includes two heads and one torso done ages ago in polymer clay). I am sort of a terrible photographer, so I plan on getting my boyfriend to help me take better ones with his knowledge of lighting and whatnot, but at the least here is something to see! 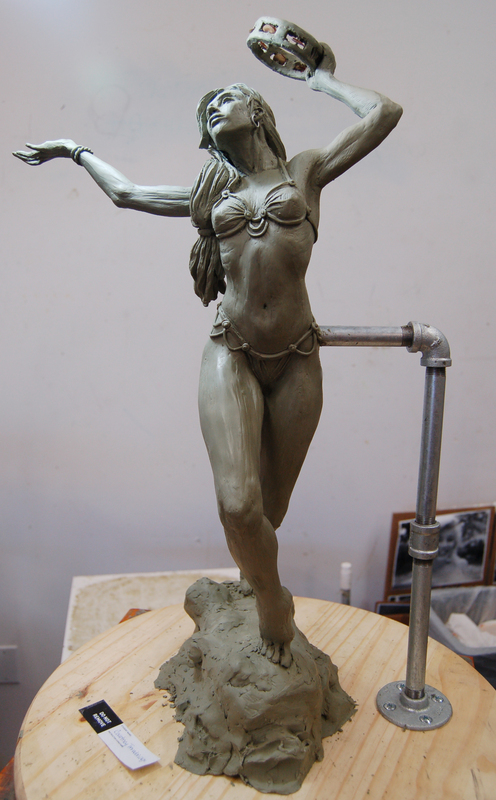 It’s a 20″ sculpt in plasticine fully armatured (with telescoping arms). I’ll try to get around to also putting up a montage of some progress shots to show a little more of how it all came together. I want to do more and get way better! And stop giving my girls beefy knees. If you want to know more about John Brown I highly encourage you to google him because he’s the bestestestest.